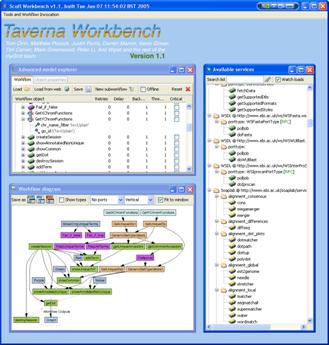 The first is Taverna, a Java application developed as part of MyGrid in the UK. Taverna has a large list of publically available SOAP-based web services, generated from scraping WSDL files, to which others can be manually added. There is also a graph-based workflow editor. The interface isn't particularly friendly, but it has potential. See also SoapLab, for providing analysis web services, BioMOBY, for interoperability, and a paper The Semantic Web and Knowledge Grids. BioSpice is in the US, funded by DARPA, and has a large set of analysis tools. It's open to anyone with a .mil or .gov email address - anyone else has to have their application manually approved (.edu email addresses get interim approval straight away). The service provides a huge array of networked or desktop tools for biochemical and other analyses. I haven't been able to try it yet, so I'm not entirely sure there's a workflow automator included, but it does look useful. The third, Projet Panoramic, still seems to be in the planning stages (and looks like it might not get finished anytime soon), but has an impressive collection of links. It's from the Institut Pasteur in France, who have been experimenting with web-based front ends to analysis tools for a long time. To investigate: BioPipe; Wildfire; GenePattern.